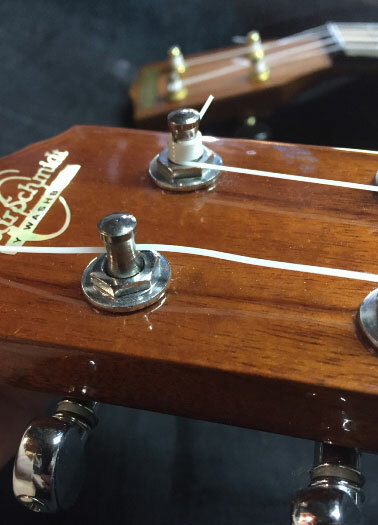 Want to change you ukulele Strings? That’s a good idea, because one of the most important parts of your stringed instrument… is the strings! =) Don’t skimp on good strings, the better they are the better your Uke will sound. Another important factor is how the strings are put on, you need to make sure they are put in the right place and in a clean manner. Haphazardly tying the string all around itself looks terrible in the long run. The first step is buying yourself some new strings, I have always preferred Aquila NylGut strings. If you have others you would like to try that is fine, but remember that the more you pay the better they likely will be. I often buy strings for all my instruments at one time from a site called JustStrings, they offer good prices and all the brands I could want. Do not ever put steel strings on your ukulele, that is a definite no-no, the tension can break the Uke in half! 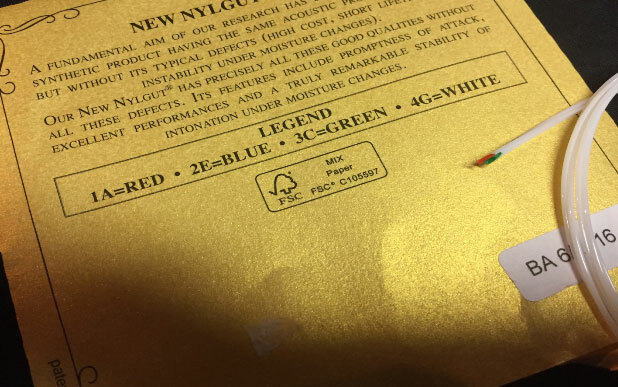 When you first get your strings they will be color-coded with a chart on the back. Sometimes the color code is painted on the string, other times they are in color coded bags. It’s important to keep the string box or packaging because different companies may use different codes. With the package you will never have to worry about forgetting or being confused. This color-coding will help you make sure you get the right string in the right place. As you can see on the image above there is a slight painted tip on each string. 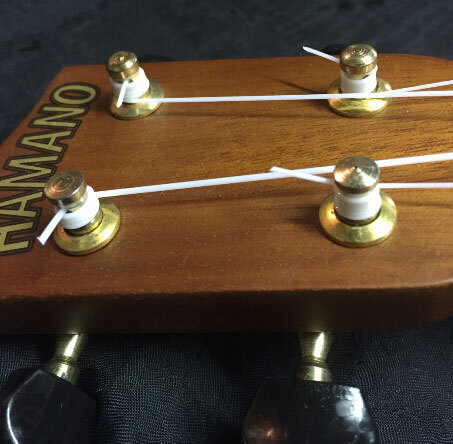 This next step is very important, do not just take all the strings off before you restring the instrument (this is especially true for guitars and steel stringed instruments because that is too much tension to take off at once). In fact, tune the ukulele before changing the strings, that way as you put one new string on at time you have a reference as to how it should sound. Sometimes as you are tuning a new string you may wonder if you aren’t even close or going too far, with other strings to reference you will always know you are close. Of course the G string on the uke is high pitched like the A and E, so you would want to compare that string to those instead of the low C. When tuning I advise using an electronic tuner or an app, there are so many software tuning apps out there for free that it just makes it easier on the beginner. Notice what the other strings look like after you have tied the string around itself a couple times. The point of wrapping the string around a couple times is so it will make a good knot when you pull it up to the tuner. When you pull the string up to the tuner run it straight through. Wrap new string around the tuner. As you can see it takes a number of turns to get the strings tight enough around the tuner, but we end up with a perfect wrap. It wasn’t necessary to knot it as the string will hold just fine with this method. I normally will not cut the excess string right away. The string will stretch for awhile and need tightened repeatedly so it is best to wait to cut the excess ends of. 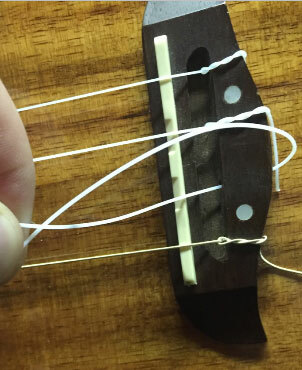 After you are finished with the G string do the same method for each of the 3 other strings. Of course with the last string you will have to cut off the excess or you tan tuck it back under the last string. It all depends if you have already tightened that previous E string yet. Tucking the strings in is mostly to keep the saddle area looking tidy. 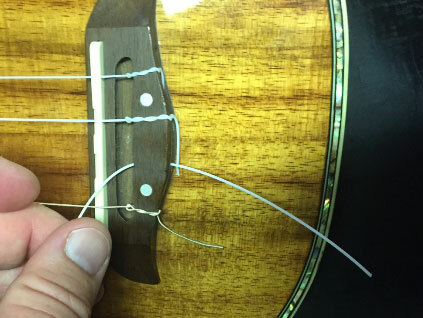 The ukulele takes a lot of tightening to get the strings in tune, and in fact a couple hours after you are finished it will need retuned all over. One way to shorten the time it takes is to actually tune the ukulele to D tuning (one step above GCEA) which is ADF#B. This will make it so as the uke strings loosen they will fall back to around GCEA, that extra tightening will help stretch them out. 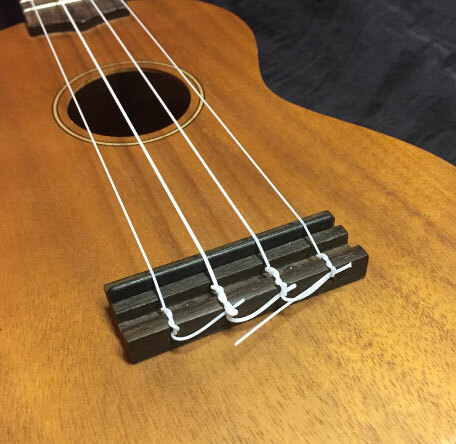 If you notice the string keeps slipping and going WAY out of tune the tuner may need tightened on the back of the ukulele with a screwdriver. Or if you find the tuner is too tight it may need loosened. If you have a decent quality ukulele the tuners should work perfect and give you no issues. It’s normal for people tuning the first time for it to take awhile to stay in tune. I remember the first time I was tuning my uke it seemed to take days to keep it in tune. Each morning it would stretch and I would have to put it right back into tune. As with most things music, restringing just simply takes practice. You may find your own particular way of doing things and that is fine. A proper restrung ukulele will stay in tune over time. Unless you let a uke sit for an extended period or move it back and forth through extreme temperatures it should stay in tune. I have a tenor uke that sat for months in its case and when I took it out to play it, it was still nearly in perfect tune, it just needed slight adjustment. That is how you know you have your restringing technique down, when the ukulele stays in tune over a long period. Very helpful article for all ages Ukulele players. Keep posting!!! Really Greatly​ appreciate..
I’m ready to restring my uke for the first time and your article with photos was a big help in giving me the confidence to just jump on it. Thanks.